Wash and soak horsegram in water for 5-6 hrs in hot pack.After it turns plumpy drain the water. Put it in the hotpack and just sprinkle water 2-3 times and keep the hot pack closed overnight.Longsize Sprouts shoots up. Wash the rice and soak it in water for 15minutes and drain the water. Heat oil in a cooker.Add Fennel seeds,Jeera.Let it crackles.Then add Chilli,Onions,Saute till light brown. Add Tomato,haldi and curry powder & saute for another 2 minutes. Scrape the coconut and grind it and take out the thick milk and again pour half cup water and take out milk. Add this milk to the rice & add sprouted horsegram. Add garam masala powder and water and salt and close the lid of the cooker. Aromatic horsegram rice is ready. 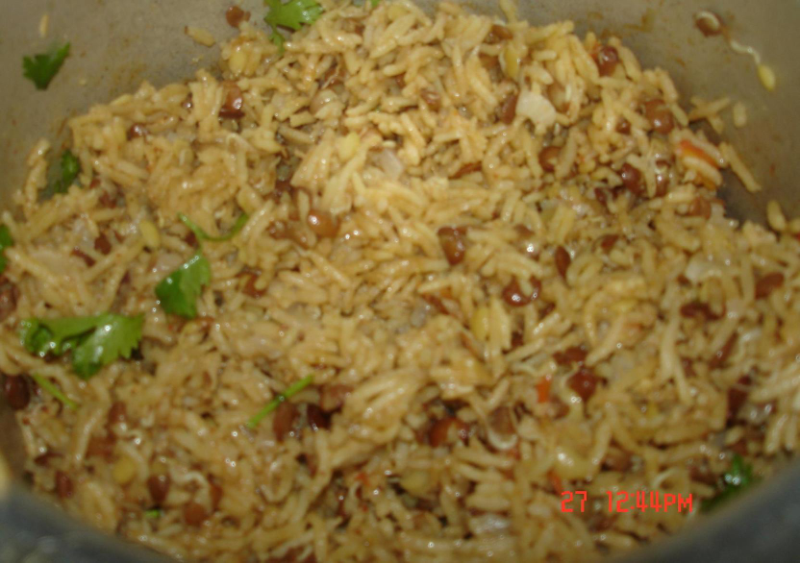 dear coolg,thank u so much but please try this recipe such a tasty rice.actually its sprouted horsegram pulav. hello rajeshwari really this is good recipie,usually people don't know the goodness of kollu,this is good for kidney stone removal.most of the people don't know hoe to use it,so ur recipe is really good and healthy.continue this good work.